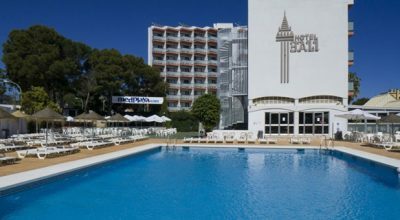 The 4 star hotel Las Palmeras is centrally located on the seafront in the popular town of Fuengirola on the Costa del Sol making it the ideal location for a golf holiday in Fuengirola for 2019. With its abundance of great bars, restaurants and nightclubs, as well as a large number of top class golf courses, you will have everything you need close by. You will be just a stones throw from the Fuengirola Marina and also the beautiful golden sandy beach, which is one of the best beaches in the Malaga province. The rooms at the Las Palmeras are of a very high standard as you would expect from a 4 star hotel. Each room is very comfortable with satellite TV, air conditioning, heating, telephone, hairdryer, private bathroom and a balcony with either City or beach views. All in all, the Las Palmeras is the perfect hotel in which to stay while enjoying your golf holiday in Fuengirola. Its great central location means that you will be able to fully explore everything the Costa del Sol has to offer and will give you easy access to many of the best golf courses. The package includes rounds of golf at the Alhaurin, Cabopino or Lauro golf courses.